Until the 1820's Long Acre was named Husband or Husbandman Street because of the large number of farms and farm workers living here in the 16C and 17 C. Some of those buildings are still recognisable. Starting near the traffic lights, Nº2 is from around 1830 and unusually is not on former Chesterfield land. At the turn of the 18C the Horsepools, butchers and farmers, owned the original plot. From about 1890 until 1911 Doctor Eaton owned it. The 1960s Eaton Place is named after him, whence the surgery moved from what is now No2A. Later the equally well-known Dr Croft lived here, commemorated in the name given to the small development of bungalows on Tithby Road on land once belonging to No2. The infill continues with the building of two bungalows here in 2002. Nº4 is on land sold by the Horsepools to William Stokes, bricklayer, who built four houses in a yard in about 1822. It is possible that parts of existing cottages to the rear were incorporated. Later a south-facing workshop with its own gable roof was added on the south east corner - you can see the join in the brickwork. The workshop was probably for framework knitting. The position of a wide workshop window can still be traced at the rear. By 1910 four had become two and in the 1920's were owned by John Cooper Hart, son of wheelwright Reuben. It became one house during the 1950s. The villas opposite (Nos1-17) were erected in 1880-7 by James Walker, whose yard is now Walkers Close. In the early 1900s Nº17 was home and workshop to monumental mason, Stephen Squires, much of who’s work can be seen in the church yard. (cousin of Albert who built Ebenezer House on the Banks). The house is now a funeral director's. Carnarvon House (No6) and Nos8 and 10 were built around 1900 on land leased from the Carnarvon Estate, the freeholds not being sold until 1920. Next door the Horse and Plough was built in 1818 as a Primitive Methodist (Ranters) Chapel. Later a Salvation Army Hall, it has also been the Central Hall, a betting office and sauna! The doors on the wall facing the main road are a recent false embellishment, but the ground floor of the original building was given over to residential cottage accommodation. Opposite, Nº10 is an early 19C farmhouse and was latterly the residence of Walker's head dairyman before the farm was replaced by the 1970's developments of Walkers Close and the Paddock. Recent building works revealed a blocked up doorway on the street side near the east end and also show that the top storey is made of different bricks to the lower storey, suggesting another example of a second storey being added later. The 2001 infill of offices, shops and flats is Linley Court, named after Mrs Linley the former postmistress who had lived in the bungalow that formerly occupied the site. The new development has been designed to blend in well with the older frontages. The architect, Alan Heafford, is a scion of the family who owned Hardstaff and Brown. 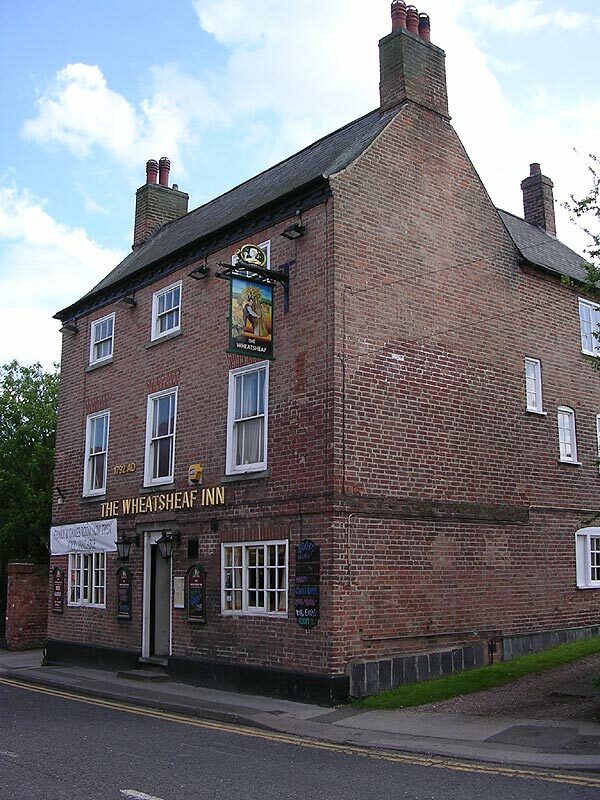 The sign proudly proclaims that The Wheatsheaf (above) dates from 1792. A dated brick above one of the windows suggests the extension was done in 1779. During alterations the date 1722 was found carved on a window timber which would have been from the original building which may have looked like this. There are signs on the gable ends of an upwards extension. Notice the change of brickwork revealing the shape of the first (probably thatched) roof, and of an extension rearwards at the SE corner - you can see the join in the brickwork. The post office moved to 39 Long Acre from the Market Place in 1936. The building has inglenook fireplaces and a central chimney which dates it at least to the early 18C. This may have been the house of the Needham family who certainly owned a two acre croft on this site from the mid 1600s. By 1801 the Needhams had moved to a new mansion in Lenton and sold the house for £785, now described as including malt rooms, to Joseph Oliver, malster, who was already the tenant. In 1807 Oliver sold the land for the development of Market Street described elsewhere. In the 1822 directory Oliver is described as a tanner and wine and spirit merchant of Long Acre. In the 1830s and 40s he was also the tenant or mortgagor of the pasture land at Kirkhills and Chapel Closes on the (School Lane) windmill site. It was formerly a hotel called the Vaults, although not appearing as such in directories until 1891. The census of 1891 identifies Henry Johnson as a wine and spirit merchant of 'The Liquor Vaults' Long Acre, presumably continuing the business initiated by Joseph Oliver! The building would have had the space for Mrs Hannah Arnesby's Apartments noted for Long Acre in 1889. The delivery drays passed through the wide arched doorway of number 37, using the hook over the door on the wall inside to assist unloading. The original steep pitch of the roof shows it would have been thatched. An old postcard (below) of the building without the modern white rendering clearly shows the newer brickwork of an upwards extension from the string course. To accommodate this the pitch was reduced, but only on the south side. Was this to add an extra storey or to give additional height to existing rooms up in the (thatched) attic? Long Acre from the top of Market Street looking west. The Wheatsheaf pub on the left is opposite The Vaults pub. 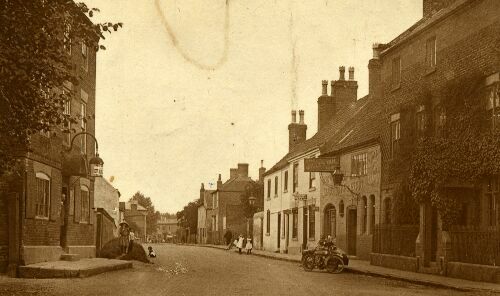 Shops next to The Vaults moving west at the time of this photograph were Morris's pork shop, Postman Mabbott and Sam Curtiss's fish and chip shop. Just beyond the little girls is a building, which has a various times been used as a Primitive Methodist's (Ranter's) Chapel, the Salvation Army Hall, a betting shop and a pub. The picture, taken before 1915, was published as a postcard by J. Sands and Son. (Photo provided by Dot Mabbott). The building at the western corner with Fisher Lane was built in 1840 as a school. The land was donated by the Earl of Chesterfield. Many pieces of older narrow brickwork can be seen on the north facade, suggesting a pre-existing building may have been incorporated in the new school building. On the east wall a large area of newer brick 'patching' was possibly a classroom window. The windows to the rear look original. The boys moved to the East Street School when it was built in 1845; the girls stayed here. Later it took infants only under the care of Kitty Kettle. Older children went to East Street. Subsequently, the 'Reading Rooms' (1896), it has been used variously as coffee rooms, British Legion (1920s) and workingmen's club. In the 1896, 1900 and 1904 directories it is recorded as the headquarters of the Bingham Town Bands (brass or string). In the 1920 directory it is a cinema operated by Sam Foster Blood who was the licensee of the Crown Inn in the Market Place. The pair of Victorian former cottages on the other corner of Fisher Lane is particularly attractive, but little is known about them at present. Temperance Hall Eastwards, Long Acre is a mixture of 18C and 19C cottages with 20C infill. The gap between Falcon House (1779) and Tealby House (1830s and named for a 17C Bingham benefactor), leads to yet another yard (Temperance Hall Lane in the 1840s, Doncaster's Yard in the 1851 census and Temperance Hall Yard in 1861) and the former Temperance Chapel. It was founded and probably built by John Doncaster in 1843 on land donated by him from Providence House (See Fisher Lane). It was rebuilt in 1882 as an Independent Methodist Chapel in attractive chequered brickwork. It is now a private residence. There is a large date stone (1882) on the front of the building, but also to the rear a single ordinary brick in the gable end carries the poorly-inscribed date 1843. A thirty-feet deep bottle well (narrow collar above ground opening into a bottle shape under the surface) is in the front garden. The pink house (No36) is Bradshaw's Cottages and is late 19C. The 1853 directory mentions the Marquis of Granby public house with licensee John Tinkler. Although one needs to be cautious interpreting census sequence numbers it is interesting that the 1851 census positions him somewhere around Doncaster's Yard. It also says he farmed 18 acres (mixing the two occupations was commonplace in 19C Bingham). It had disappeared from directories by 1864. Much of the brickwork of Pinchpenny Cottage (No38) is from about 1720; the interior structure with a twisted staircase and the remains of inglenook fireplaces support this date. A previous resident found thousands of animal bones in the garden and concluded it may have been a veterinary surgeon's home and practice. Certainly a veterinary surgeon named Ebenezer Hutchinson is recorded in Long Acre in from 1848 to 1864/5. By the time of the 1881 census he had retired. 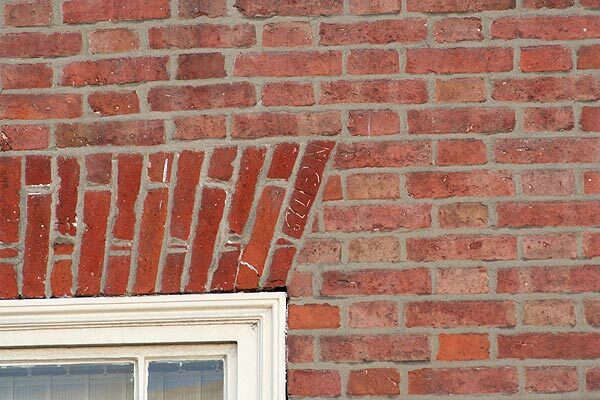 No40 is of similar age; the modern brick patching suggests it may have been one of the several shops in Long Acre mentioned in 19C directories. The dentist's surgery on the north side is on the site of one of several blacksmiths' shops recorded during much of the 19C. Some of the building may be original. The grounds of No53 formed the old Chesterfield Estate timber yard; the present house is a converted barn. There may have been living quarters here as John Watson, woodman, is recorded in the 1865 directory as living in Long Acre. In 1904 John Scott was recorded as forester to the Earl of Carnarvon and living in Long Acre. Nos 61/63 are amongst the oldest houses in Bingham being of mid 17C cruck construction underneath 19C Arts and Crafts imitation Tudor decorations, carried out by architect Beetham Shaw who lived opposite at Eskdale. The coach house was his office; the original furniture and fittings are in store in a Nottingham Museum. Regency House is mid 19C and was a tearooms in the 1950's before becoming a decorator's house and shop. The Victorian villas further east (Nos 71-85) are known as Porchester Terrace and were built in 1883/7. Seven of the eight residents of 1894 merited an entry in the directory of the time. One of these was Henry Wootton, one of the succession of doctors to have lived in White Lodge, Church Street (in 1889). He had presumably retired to Porchester Villas as they were then known. Porchester Farm has an early 19C front but other parts of the building are 18C. The Bowls Club occupies what were the 18C dovecote (for meat and manure) and a stable of the farm. The battered remains of a young woman murdered towards the end of the 1800s were found under the stable floor during restoration. The modern shop at the junction of Long Acre and Long Acre East is on the site of Reuben Hart's late 19C blacksmith and wheelwright's premises - his cottage next door is 19C but extended in the 20C. In 1931 documents Long Acre East was just Long Acre, 'East' being added later. Mostly modern development on former fields and closes, there are a number of older properties scattered at intervals. The Pinfold, a pound for stray animals, was on the site of the modern development named for it. The symmetrical arrangement of windows shows Boscobel House (No8) was once a pair of sem-detached houses. Next door is No12 not No10, confirming the point. They were 19C tied farm cottages once serving Starnhill Farm, part of the Chesterfield Estate. Holme Lodge was released from the Crown Estate only in 1951. It was built around 1830 as the residence for the Earl of Chesterfield's estate manager. Its grounds extended south to Grantham Road and were sold in 1965 to build the bungalows of Perry Grove. No18 was built in 1965 on another plot from the Holme Lodge sale. It is actually an engulfed cottage - the modern house has an old cottage at its core. The conversion of an old Holme Lodge barn (No18a) in 2001 revealed that some of the north wall was of mud construction, similar to the wall between White Lodge and Robert Miles School in Church Street, thus making it probably mid to late 18C. The barn had a chimney suggesting some domestic use originally. 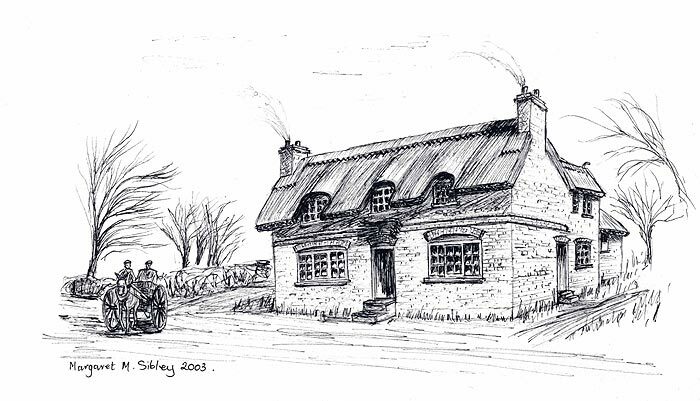 It was built to the same proportions as Donkey Green's Cottage, opposite. Donkey Green's Cottage is another candidate for 'oldest house' in Bingham. It is 17C but named after Robert Green who sold garden produce from his donkey cart in the 1880s. Sold by the Crown in 1931 it was subsequently purchased in 1944 by the then tenant of Holme Lodge. The properties remained in common ownership for 20 years. A detailed historical report is available. East Cottage bears the date 1860 and the letters JW. We think this was for the builder rather than the first owner. Next door, number 29 has a date stone beneath the west gable end marked HT 1909. The house was built for Mr H Thompson on land that had once been part of a large plot called Parr’s Close. East Cottage’s land had been another part of the close.